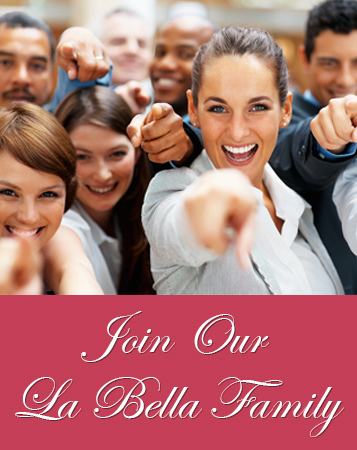 La Bella Baskets Has A Purpose, Single Moms! This is a special program created and launched by La Bella Baskets in December of 2009. We believe every gift has a purpose, and our purpose is to give back. This is why we have chosen to give to single moms nationwide. We understand the hardships and challenges single moms go through every single day, and we want them to know that we do care about them. Our mission through this program is to empower and uplift women while helping them feel beautiful, important, and cared for. To show our appreciation, every month we deliver to single moms a La Bella Basket of Smiles filled with beautiful Spa and Bath essentials. We deeply believe that every single mom needs a calm and nurturing place in their lives to relax, melt away stress, rejuvenate, heal, and promote a truly 'blissful balance' in body, mind, and spirit. All purchases from La Bella Baskets directly contribute to our La Bella Baskets of Smiles Program. Thank you for all your support, and thank you to all of our La Bella Baskets Consultants for making this program possible. The following are just a few of the messages we have received from single moms who have been given a La Bella Basket of Smiles. My sister Sylvia has been a single mom since her son was born. She lost both of her parents shortly after her son was born and has had a difficult time raising her son and adjusting to being without her parents. When Sylvia received her basket of smiles gift basket, she had nothing but accolades for your company! To hear my sister's expression over the phone was so amazing! It offered her "hope" to know that someone really cares about her, and it brought a huge smile to her face. I know she will always remember her beautiful spa gift basket. Thank you for such an incredible gift to her." "The gift basket that I received was gorgeous! I am truly enjoying the relaxing eye mask and all the beautiful bath essentials that I use after a long hard day at work. I have never received a spa basket before and I truly appreciate it so much. Receiving that gift basket truly touched me and I am so grateful. What a tremendous program you have. Thank you from the bottom of my heart!" "Heartfelt appreciation is sometimes hard to put into words but I was so surprised when I received my Spa gift basket. Thank you La Bella Baskets, and thank you my dear friend Monica. This is so wonderful what you guys are doing." "wow wow wow- When I received this, at first I said is this a mistake - then when I read the message, I was so touched. This really made my day. Thank you La Bella, and thank you Tanya for thinking of me. I am so touched by this and I cannot wait to pamper myself." "I have never heard of such an incredible thing before that you are doing for single moms. This really gave me such a warm feeling inside. I will look at this day as one not to ever forget. Thank you so much La Bella baskets and Pat -words cannot express the friendship we have." "This came in such a perfect time in my life. Receiving such a kind gesture, I was overwhelmed with joy and hope. It is so nice to know that people care for us. Times are so hard for me right now but I know it will get better. Thank you La Bella for such an amazing program, and thank you Jocelyn - you are such a kind hearted woman always thinking about others. Thank you for having a giving heart"
"I really cannot believe what your company is doing. Thank you, Thank you so much. Receiving this beautiful gift made me so happy. Thank you Bella Baskets. I want to also say thank you to my church, CPB, for thinking of me. I know I am so blessed to have such wonderful caring people always around me and thinking about me." "OMG when I received this I was so surprised. This is an amazing gift to give out just because. I know my life right now could be so much better, and having 4 kids I am really trying so hard. I am smiling today and I feel good that people are watching over me. God Bless you La Bella and Dianna - you are friends everyone would want to have. Blessings to all."